Living in a rental home can feel like a limbo stage. You are in a house, a house that is yours, but not really yours. The itch to decorate and make it your own starts to set in, but you are unsure of the “can” and “cannot”s of the rental home world. 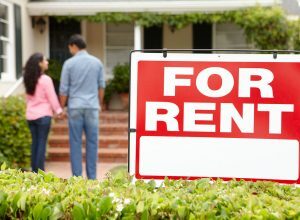 The answer is always “no” unless you ask, so it is best to ask your landlord/property managers to obtain the owner’s approval on any changes you wish to make. Not sure where to start or what to ask? Painting is an easy way to give a house a facelift. Lighter colors can make a place feel less small and more open. An accent wall can create a focal point that gives your home a pop of color and style. Find a color online or pick up a color swatch from your local hardware store to show your landlord so that they can run it by the owners. If they approve, break out your rollers and brushes! If the owners will not let you paint, you can use temporary wallpaper, or contact paper, to temporarily spruce up your walls. 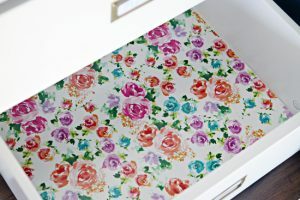 Contact paper can also be placed in the lining of your cabinets or drawers to add flare, but also ease any sanitary concerns. Window treatments are a great way to jazz up your house and give in that “home” feeling. If you are on a budget, go to consignment shops to find cheaper rods and curtains. 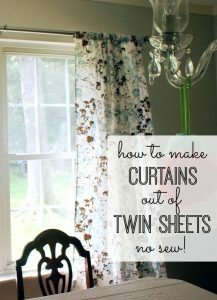 To stretch your budget even further, if you or a friend own a sewing machine, you can buy fabric and make your own curtains! 4. Can I Get Your Number? 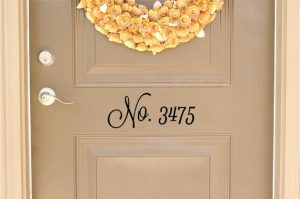 Adding vinyl letters is a cheap and adorable way to temporarily dress up the exterior of your rental home. If you don’t want to use numbers, you can get a “welcome” vinyl to place on the door. Once you are ready to leave you rental, just gently peel the vinyl off. 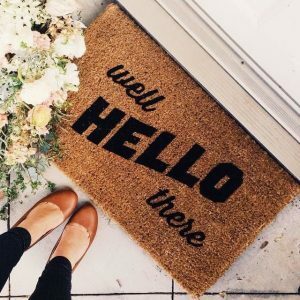 You wouldn’t think, but an updated welcome mat can benefit your new home. Not only does it add a sense of freshness to your home, it shows off your personality while also boosting curb appeal. For $10-20 dollars you can find a cute, new door mat at your local craft or home improvement store. To save money, you could probably find a lightly worn mat at a thrift shop. However you say hello, a welcome mat is a great way to keep shoes clean and smiles on faces. When hanging up decor in your rental home, there is usually the fear of ending up with a giant hole in the wall. A way to avoid this scare is to use clear thumbtacks or 3M Command strips. 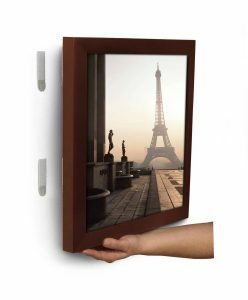 They are easy to install and come down with little to no mess or damage. 3M Command strips are customizable as they come in different colors and sizes to suit your needs. 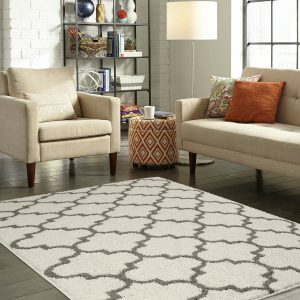 Accent rugs are a great way to dress up a floor space, but also give it a lived-in feeling. They are eye catching, tie a room together, and add extra comfort to your home. Even something as simple as a runner in the front walkway instantly adds “homeness” to the house. Rugs can be found cheaper in discount stores or in surplus warehouses. Adding a mirror to a room is a fantastic way to make the space look and feel larger. The reflection from the mirror casts images in such a way that enlarges the room, giving it a more open feeling. 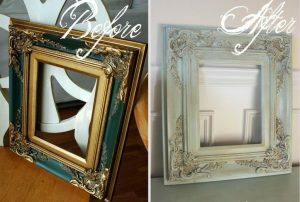 New mirrors can be fairly affordable or you can repurpose an old one! 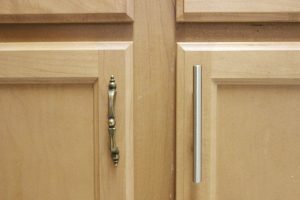 Swapping out the outlet covers, cabinet knobs, and drawer pulls is an easy to upgrade your rental home by adding your own personal touch. For under $20 you can change out all the outlet covers in your entire home. Just don’t forget to save all the original pieces in a little baggie to put back where you found them when you decide to move out!